Strolling onto the Newborn square, the word that could be used to describe the appearance of the AUC group would be nothing but dapper. Dressed up for the first time on this trip in suits and business clothing, the feeling of officiality was lingering in the air. Today was going to be a day filled with official visits with organizations such as EULEX, the youth parliament and Vetevendosje on the program. The first stop was EULEX, where we were greeted with airport-like security and rows of 4x4s with official EULEX license plates. The set up of the meeting room had a similar vibe where the EULEX Representatives were quite frankly grilled by the students on everything from the vision for EULEX to the hotly disputed topic of corruption within the organisation. Thankfully at the end the Representatives thanked us for the questions and said that it truly made them think critically. Our lunch was equally businesslike with a brief stop at the hip healthy food bar Green and Protein which was a welcome change from all the Albanian pastries which we had consumed over the past few days. From there we strolled over to the parliament where we met the youth parliament representatives. We were herded into the meeting room after shaking, what it felt like, every person in the building’s hand. After a quick round of introductions we quickly got onto asking questions which were translated by numerous people at multiple points, sometimes making for a rather different interpretation or response than anticipated. 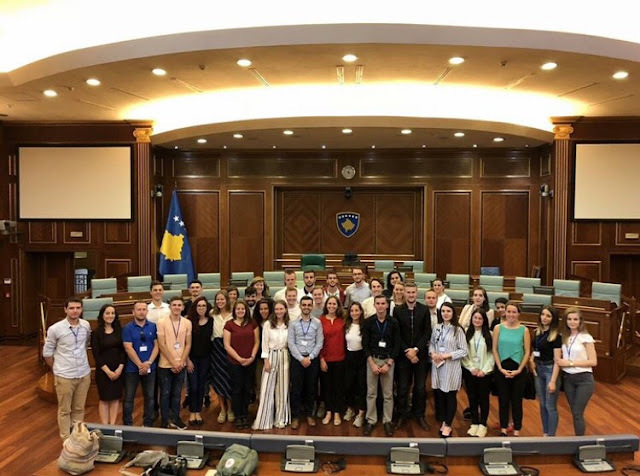 They led us to the chambers of the parliament where we sat in the seats of the most powerful men (and some women) in Kosovo, or at least that’s what it felt like. Again the response to some of the questions posed to the youth parliament was rather activistic, which can be highlighted with the response by one of the students to the question ..., which was “three words: corruption, corruption, corruption”. Where in response the president of the youth parliament took him aside and proceeded to give him, what it looked like, a stern telling off. However, it was in Albanian so the true sentiment of the discussion will never be known to us. After the parliament we proceeded to the bar Soma where we had a drink with the youth parliament members before quickly heading down to the Vetevendosje where we met the disputed leader Albin Kurdi. Which was to the least a very interesting encounter. The first being “when you cry you see clearly”, and describing Kosovo as being situated at the heart of a “Russian babushka doll”. He also threw around the names of several European philosophers and writers such as Foucault, Bourdieu, Wendy Brown and Judith Butler. However, i got the feeling that this was more of a name-dropping exercise rather than that he truly understood what the meaning of the texts were. Somewhat disingenuous, but passionate, are perhaps the words I would use to describe Kurdi, but then again this description may be used to describe most politicians. After dinner we headed over to Bon Vivant for Chiara’s birthday where we reconvened with the members of the Youth parliament! Reflections on Kosovo: What Lies Ahead?